Late Friday night we strolled through downtown Seattle, tired and hungry and eager to dive into whatever monstrously oversized entree The Cheesecake Factory–my daughter’s birthday restaurant of choice–would dish us up on arrival. Our spirits were high as we took in the shimmery Emerald City scene, my daughter pointing out the countless twinkle lights that covered the trees lining the streets, making the misty northwest night feel bright and safe. Admiring the sleek but whimsical modernity of our surroundings, I couldn’t help but comment on the magic of Man Over Materials. So much innovation, I thought contentedly, all conceived by the ever-progressing Human Being to enhance this thing called Life. Was there nothing we couldn’t do? No, I told myself, looking up to the skyline, there was nothing we couldn’t–or couldn’t eventually–do. We were obviously just a killer smart species. I slowed my pace, lost in these happy thoughts, when It came around the corner and almost knocked me over. What? you are asking. What almost knocked you over? 3) choose the most hyperbolic, self-important, embarrasingly hopeful superdupersecret code name they could think of: It. Kind of like when Michael Jackson named his final tour This is It. This is what? Ah-kward. Referring to this tool/device/apparatus/whatever-the-h-it-is as “It” implied that, like MJs concert, this was the ultimate, singular invention of our time. This was the one. Steve Jobs was quoted as saying, before its unveiling, that “It” would change our lives as much as the personal computer did. Forget all those other chintzy contraptions, like the internet and the smart phone; this was It. People are accustomed to–and like–walking short distances to reach their destinations. If they don’t have time to walk, or they don’t want the exercise of a bike, they will find a faster, easier mode of transportation, like, oh, I don’t know–a car. The Segway moves too slowly to replace walking, and isn’t the point of a motorized vehicle to get you there faster? And until they make special Segway lanes, “It” is too big and clumsy to navigate sidewalks–not to mention too dangerous, looping and coiling carelessly around unsuspecting pedestrians. (See pp. 1 for my near-death experience.) 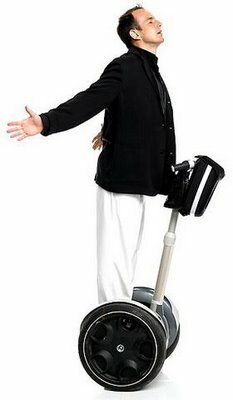 On top ofall this rests the real, silent tragedy of the Segway: you look like an imbecile riding it. I think this why I’ve never seen a woman on one. Our gender’s intuitive vanity has provided resistance. And so my rendezvous with Seattle–that glittering metropolis of progress and technology–was tainted by the reality of really smart people’s really dumb ideas. Mr. Jobs may have been infatuated with “It” but the American consumer, I’m proud to say, was not. The clever little walker for people who could already walk didn’t change our world, it simply made it funnier. Which isn’t such a bad thing, except that it cost some people a lot of money to do it. Mr. Jobs may have been infatuated with “It” but the American consumer, I’m proud to say, was not. 3) he will never, ever pick up a chick while riding that thing. Top ten New Years Resolutions for 2014.